The soul always knows how to heal itself, the challenge is to silence the mind. The psychological impact is the hardest. It's like you forget that your brain needs to recover as well. It got starved of oxygen so had a trauma. But I had focused on the physical issues of the heart. It was clear that the last 5 weeks had seen all that build up released. I have never been so emotional. I cried so much I didn't know a body held that much fluid. I cried for the life I had, I cried about how unfair it was and I cried for the fear of the future. how could this have happened? I am seeing a psychologist to talk me through the fear and anxiety and hopefully this helps me get into public places again and learn to trust myself. My cardiac specialist is very understanding and lets me email him when I need to. I get check ups where I need to see something visual to see if the rythym is still missing. The anxiety of being left alone can be overwhelming. Debilitating almost. I hate being alone in my own home. I also recognise that I am getting better. Slowly but surely. Anxiety and panic attacks are awful and I need to learn to deal with them so as not to dictate my life. This shocking event hasn't just affected me. My husband had his life flipped over as well. One day he had a normal life with an independent healthy wife, the next day he's told her heart stopped and she's in emergency. I can't even comprehend what that would have been like. He fielded many phone calls, kept friends up to date, kept school up to date and his own family. He's also been my chauffeur as I can't drive. Doesn't question (most of the time :) ) just takes me where I want to go. My parents, who I am close to both were devastated. Again, how do you react when you're told your daughters heart stopped and she had to be resuscitated? I asked my mum and she said when dad told her, she didn't believe him. 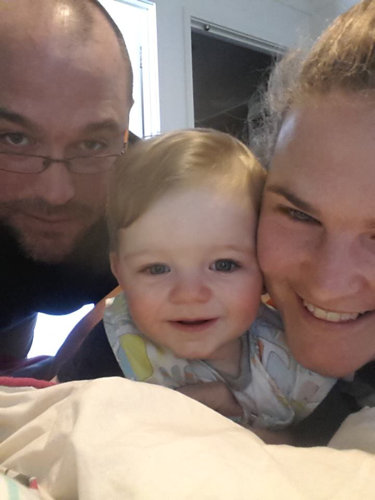 They have cared for our son, looked after our house and have just been there. My husband could come in to hospital after work and not stress. That was invaluable. They even baby sat our dog. Henry adores them and we can hear about all the things he's done and things he has learnt from them. They also have driven me to appointments with no question and cancelled many of their own functions and activities to stay with me. My brother has supported my parents and visited me frequently. It brought us closer. I feel sorry that now he has this question of will this happen to me? His girlfriend Brooke has ridden this emotional roller coaster with him and supported us all along the way. My inlaws were devastated. They live in Sydney and my sister in law is overseas. They kept the whole McRae family updated and I was so touched that so many who I had mainly just met in January were so concerned and wanting to know how I was. My mother in law flew in from Sydney to visit me and check I was ok.
My friends were all shocked. I've had some of these friends for nearly 20 years. Hannah was amazing and I don't think I tell her enough how wonderful she is. What she has done for our family just makes her special. She is part of our family. Claire visited me in hospital on one of my bad days. It was a surprise visit but it perked me up. Emily was devastated and kept in touch with my family. I can't wait to see her at Christmas. Lee sent me messages checking how I was as did many others. Sally visited me in both hospitals. It made a massive difference to see a friendly face. I loved them all and am so lucky for them all. My cousin Craig brought his little girl Lily in to see me. I got amazing flowers and he was so pleased to see me ok.
My mothers group sent me goodies and made meals for my family. It's hard to explain how amazing that is. It makes a huge difference to those at home when they don't have to think about dinner. My work colleagues and friends have been amazing. So supportive, sending messages, cards, gifts and cooking my family meals for several weeks. It brings tears to my eyes when I think how much people care. Always asking how I am and just understanding that I went through a trauma and I was struggling. Nicki will be my friend forever- she was with me on the day of the arrest and saw me brought back to life and she was with me at my second shock, coming with me to hospital. She showed so much care and compassion. Yvette has been amazing- visiting me, checking up on me and generally being a wonderful human being. Catherine has been an amazing support. She was left with a huge work load and I never heard her complain. She let the kids keep in touch, sent me well wishes and just kept everything running smoothly. I honestly can't thank her enough. My teaching team were a wonderful support, taking up extra jobs that I left behind and just sending me positive thoughts. Some parents of the kids I taught were so lovely, sending me supportive messages, texts and checking how I was. I was touched that I had made an impact on their child's life. My little Henry. He's only two so doesn't know what happened but he knew mummy was in hospital and his visits were heavenly. The first time I got to see him after the arrest was amazing. He was on the visitors lounge couch and I walked in and just grabbed him in a bear hug and cried and cried. He sat there and hugged me back. He was so good every visit. He greeted everyone and saw my cords and needles and knew mummy was sore but getting better. I adore him and glad I get to keep being his mummy. Two other people that I didn't know before April will never be forgotten. Luke and Michelle were the two Aldi staff members who worked on me until help arrived. Without them, I wouldn't have been resusitated. I see them often and we always have a chat. It's an incredible connection to have with a human. There have been many others and I just want to be clear that I have appreciated every message, every smile and every word of encouragement. I feel very lucky that I fought back and my heart restarted. It's amazing to think it stopped. But everyone I've come across, met both physically and online support has been amazing. Another check up on Thursday...let's see what he says.